on the roots of the trees. CHIQUI VICIOSO Sherezada “Chiqui” Vicioso was born in Santo Domingo, Dominican Republic, June 21st 1948. Graduated from Sociology and Latin American History at Brooklyn Collage, Nueva York, with a Masters degree in Education at Columbia University and postgraduate studies in Cultural Administration for the Getulio Vargas Foundation (Brazil). She has been honoured with the Anacaona de Oro in Literature and the Gold Medal to Women´s Merit in 1992. Her work includes: Viaje desde el agua, (Journey from the water) 1981; Un extraño ulular traía el viento (A Strange Wailing of the Wind), 1985; Volver a vivir: imágenes de Nicaragua, (To live again: Images of Nicaragua) 1986; Julia de Burgos, 1987; Algo que decir: ensayos sobre literatura femenina -1981-1991, 1991; Internamiento, 1992; Salomé Ureña de Henríquez (1850-1897): A cien años de magisterio, 1997. 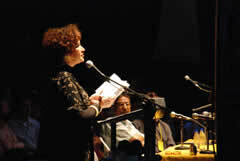 She has written plays such as: Wish-ky Sour, Nacional Theatre Award 1996; Salomé U: cartas a una ausencia; Desvelos (dialogue between Emily Dickinson and Salomé Ureña); Perrerías, and NUYOR/islas. She has achieved a significant impact on Dominican literature and culture in the past three decades. She organized the first Circle of Dominican Women Poets now named Circle of Creative Women, as it has expanded to include more women. For many years she lived in the United States and her first writings reflect her North American upbringing, mainly in her very personal use of the spanish language. Since her return to Santo Domingo, in the early eighties, she has been untiring in the search for her roots and a personal poetic voice that distinguishes her from the women of her generation. Her first book, Viaje desde el agua, published in 1981, established her as one of the voices to be heard in the Dominican Republic. Sherezade, she of the thousand tales and the thousand shapes, has been given new life in the splendor and despair of the islands, lived in by and sung by a mulatta Sherezade of the Tropics, rising from the edge of the sea and memory, to celebrate our raw hybridity and our ancient and ever present legacies. // Daisy Cocco De Filippis, Author, /A Diaspora Position / New York, 2005.